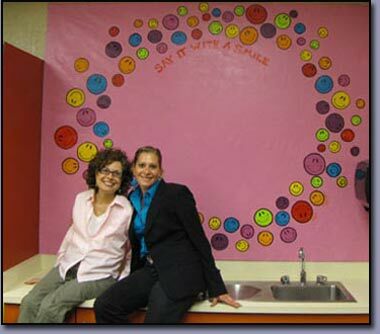 Troy's Bemis Elementary School receives more colorful wall decor courtesy of I/ACT artists Diana Jellinek and Linda Shears. 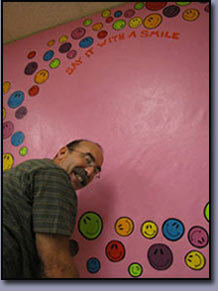 Interior Design associate Tim LaRou devised the final installation. 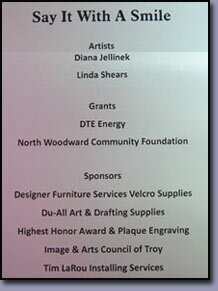 Funding was received from the N Woodward Community Foundation and DTE Energy. Interior Design associate , Tim LaRou of Tim LaRou Installations devised a method to affix the free standing canvas mural to the wall. Thanks Tim! 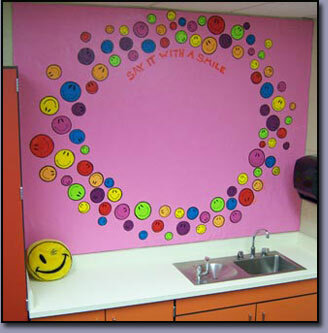 "Say It With a Smile" mural designed and painted by Diana Jellinek and Linda Shears. Grants provided by North Woodward Community Foundation and DTE Energy.